Up to the present time, history texts, and encyclopedias have failed to provide information about what happened to the ancient Assyrians, after the fall of Nineveh, primarily, because Greek historians who wrote about them corrupted their name to Syrian by dropping the starting A in their name. Furthermore, they gave the name Syria to the land west of the Euphrates because it had been part of the Assyrian Empire for 300 years before the fall of Nineveh. Consequently, references to Assyrians as Syrians led to the wrong assumption that Assyrians no longer existed. The term "barbarians" to the Greeks meant non-Greek neighbors of the Assyrians, including the Persians, who were far better informed about the exact nationality of the fighters who served in their military. In a book, titled: “Assyrians Beyond the Fall of Nineveh”, William M Warda provides historical and archaeological evidences to prove that ancient Assyrians survived their 612 B.C. defeat and their descendants continued into the Christian era. Archeological discoveries in recent decades have proven that Assyrian communities in the cities of Assur, Hatra, Edessa, and Harran worshiped the ancient Assyrian gods such as Ashur, Shrua, Ishtar, Bell, Nebu and Nergal until the 3rd century AD. They also celebrated the Assyria Akitu Festival, and gave their children names that were inline with names during the neo-Assyrian period. 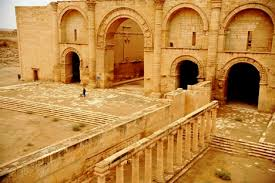 Assyrian temple of the sun god in the city of Hatra. 612 B.C. Assyrian gate of the city of Assur in Assyria. 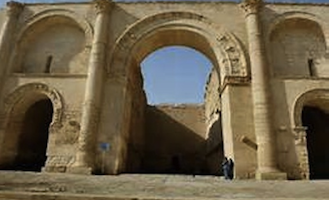 The picture on the left is of the 3rd century A.D. Assyrian temple of the sun-god in the city of Hatra. The picture below it shows the 612 B.C. gate of the city of Assur before the fall. 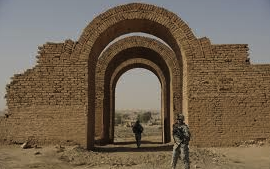 Comparison of the two images indicates that arched gateways, which played an important role in the ancient Assyrian architecture, were common in the 3rd century AD buildings dedicated to the ancient Assyrian deities. This fact contradicts Joseph’s assertion that “ancient Assyrians were wiped out, down to the last living one,” and his opinion that modern Assyrians are Aramean rather than Assyrian. Another view of the temple of Shamash in Hatra. Since the early centuries of Christianity, Christian Assyrians have observed a three-days fast called Baota d’ Ninevayee, or “the wish of the Ninivites” based on the book of Jonah of the Old Testament. Nineveh became an important center of the Assyrian Christianity. It was presided over by a long list of bishops from 554 AD to the late ninth century. Later its bishopric was transferred to Mosul. Mar Emma, the Bishop of Nineveh was elected Patriarch of the Church of the East and served in that position from 644 to 647. Ishoyahab was the bishop of Nineveh (627-637). When the byzantine forces under the command of Roman emperor Hercules, defeated the Persians near Nineveh in 627 he fled to his estate in the mountain during the war because he feared that the Byzantines might take him prisoner. (William G. Young, "Patriarch, Shah and Caliph", Christian Study Center, Rawalpindi, Pakistan 1974, p. 87) Christian Assyrian writers, such as the fourth century Mar Ephraim the great, the fifth century Narsay Kinara d rouka, the 7th century Ishoyahab III, the ninth century Timothy, the 12th century poet Ghiwargis Warda Arbilaya, the fourteenth century Sleewa Bar yohana, and others, in different centuries, have identified their people as Assyrians. Given such facts it is obvious that those who question the Assyrian identity of the modern Assyrians and their relation to the ancient Assyrians do so because of their superficial knowledge of the Christian Assyrians' history, or they do so out of malice.